I was hoping you could offer me some towing advice. Having never towed with an automatic (until last week). I wanted to know if there is a better driving mode to be using, or anything else I need to consider to avoid things like overheating and other wear and tear? I recently bought a 2.0 petrol KIA Stinger after it was awarded best petrol towing car of 2018. 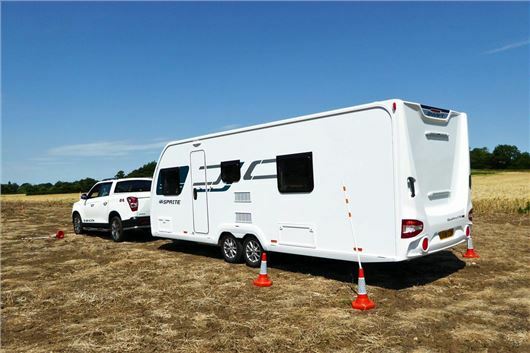 I have only towed one short journey with it so far (towing a Tab 320) but I'm very keen to make sure I am aware of all the top tips to keep the car, caravan and passengers safe and happy. Any advice would be great. I'm not a big tower. All I can tell you is that the big advantage of a torque converter auto is harmless slippage which makes for a much smoother take-off and doesn't burn out the clutch as it can do on a manual car. However, what can happen is that towing a heavy weight (the Caravan Club recommends no more than 85% of the weight of the car) can cause torque converter slippage while driving and the transmission might need additional oil cooling. If the transmission allows, it may be better to lock it in a gear so you are running at an engine speed that delivers decent torque. You'll get proper towing tips from the Caravan Club. We have a 2015 Toyota Auris Hybrid 5 door hatchback on lease due to expire in a few months. We really like the car, its reliability and its efficiency for London driving. We are tempted to pay the final payment and buy it outright for £7k but are worried about future upkeep costs including battery replacements on a hybrid and also future reliability as we know nothing about this technology. What would you advise? We are happy to look at other models either to buy outright second hand or take out another lease if that would be more sensible in respect of future costs. I very rarely hear of failed hybrid drive batteries on hybrids. There are rumours of expensive failures but except for a Lexus, no one has complained to me of an actual failure. The reliability and low running costs of this powertrain are why Prius and Auris Tourer models are much coveted by taxi drivers and why used prices have risen. So you are probably safe to pay the £7,000. We are looking to replace our Honda Jazz (4 years old, 20,000 miles) and are looking for advice. We have a change in circumstances and so the replacement car needs to be economical for driving a commute of 40 miles each way on dual carriageway and motorway, plus up to a 20-mile drive near to work for job, so need a car with at least 100-mile range. Also, I am six foot six inches with long legs. We have the space for a home charger to be fitted. We are considering electric: either Nissan Leaf or Hyundai Kona, but prices are high, we have £10k on top of what we can get for the Jazz and could then fund £10k on an interest free credit card. But we normally buy used and have never taken credit for car finance. Could you advise on electric car, best way to buy used (realise may be difficult for Hyundai) or whether we should opt for another petrol but larger than the Jazz and fuel efficient. If latter what cars? Your Jazz should be doing 45-50mpg and it will be quite difficult to beat that in real terms. Some smaller diesels will do 60mpg plus, but the penalty of that is maintaining their very expensive emissions systems. You could swap to a used Renault Zoe, but will then be faced with a battery lease of £59 a month and Zoes have not been 100% reliable. What goes wrong with electric cars and PHEVs (quite a lot) is the charge control unit. We recently drove the KIA e-Niro and I can tell you it is extremely impressive, with a realistic range of 250 - 260 miles: /road-tests/kia/kia-e-niro-2019-road-test/ Same drivetrain as the e-Kona, but 50% more luggage space. However, £33k is a lot to stump up. I'd stick with your Jazz. Ours has done 105,000 miles and shows no sign of giving up. We have a 2015 diesel Ford Kuga Titanium X Sport Automatic, with 36,000 miles. Irregularly, when driving at 50-60 mph, it will stutter for several seconds giving the feeling of crossing severe rumble strips. The dealer originally said it was the transmission but revised this to a fuel issue so replaced the fuel filter. Two months on and it stuttered again, but does not show a fault on the information display. The stutter is quite alarming, any thoughts please? Overpressure the tyres to help prevent flat-spotting. Put the car away clean, dry and under a dust cover, preferably after a run in the dry so there is no condensation in the engine or exhaust system. Hook the battery up to a battery conditioning float charger to maintain the battery at a constant 13.5 volts. (Made by CTEK, Accumate, Ring, etc. and available from Halfords). Lock the doors. Do not leave them open. But perhaps open a window by a half inch crack. Recently, the engine management light on my friend's 2013 Polo 1.4 petrol has come on and the automatic gearbox will only select gears 2, 4 and 6, even when trying to manually select 1, 3 and 5. When it changes gear, the revs rise in-between changes before the next gear is selected. I'm guessing that it has a DSG box and for some reason it is not engaging the odd number gears. Apart from that, the engine runs fine. Your thoughts would be much appreciated. Yes, it has the troublesome DQ200 7-speed dry clutch DSG that has gears on two shafts, each individually clutched. Could be the clutch has packed up for 1, 3 and 5. Could be a problem with the Mechatronics. My advice is to get it fixed by a member of http://www.fedauto.co.uk, then get rid of it. Replace it with a Honda or Toyota CVT (not a Nissan CVT), or a Mazda, Peugeot, Citroen or Ford with a Torque converter auto. I drive a much loved and excellent 2003 Subaru Forester 2 litre non-turbo petrol and tow my Model T Ford behind it on a 4-wheel trailer. Low ratio has made reversing the loaded trailer up our drive so easy. We should, reluctantly, replace it with a used car because we have recently replaced the ABS pump with a used spare so would like a car with a more upright driving position as we are both over 70. Apart from the occasional car rally we do not cover more than 10,000 miles per annum. What is the smallest SUV or other car that would still be capable of towing my old car? We assume we will not have the choice of low ratio any more. What is the combined weight of Model T and trailer? Model Ts were quite big. but not necessarily heavy (540–750kg). Suzuki Vitara AllGrips don't have low range, but can tow 1,200kg, if that's any use. The 1.4T Boosterjet has now been around for nearly 3 years so buying used is feasible: /road-tests/suzuki/suzuki-vitara-s-boosterjet-2015-road-test/? I read in the Sunday Telegraph your liking for the Puretech 130 engine and its 6-speed manual gear box. I have a Peugeot 3008 fitted with this engine and have the following comments: It cruises very comfortably at 70 - 80 mph (I live in France so 80 mph is legal in places) and the gearbox is easy to use. It is not as economical as I expected. I achieve 36 - 38 mpg on my daily usage involving journeys of about 10 to 14 miles. Longer runs on motorways I get 42 mpg. The engine lacks torque. It is very short legged i.e. it uses far too many revs when cruising e.g. 2,700 rpm at 70 mph. To my mind high revs = poor economy. I would prefer the 5th and 6th gears to be more long legged, which would mean I would have to change down more often when on motorways which is a price I consider worthwhile. What are your thoughts to my comments? I averaged 48.54mpg over 12,000 miles in a 308 fitted with the 1.2 Puretech 130 engine and 6-speed manual box. It was brilliant in that car. Certainly didn't lack torque. It would romp up a certain 'test hill' I know, pulling 80+ by the top. (/our-cars/peugeot-308/) Maybe the weight of the 3008 goes against it. We didn't do enough distance to properly check the mpg in our 3008 test: /road-tests/peugeot/peugeot-3008-2017-road-test/) But I did get 48.6mpg testing the 3008 1.5HDI 130 EAT8 over 1,750 miles and am awaiting a long term 3008 1.2 PureTech 130 EAT8 with Grip Control. Please can you log your mpg here: /realmpg/peugeot/3008-2017 / You are actually getting similar mpg to the UK average despite the higher 130kmh limit in France. When I finally get my 3008 1.2 Puretech 130 EAT8 with Grip Control I'll log regular reports on the site. My wife's Audi A1 1.4 TFSI has been excellent: brisk performance, yet up to 55 mpg. With engines like this, no wonder the small diesel is dying out. We have a couple of options (1) Simply p/x my wife's Audi A1 1.4 TFSI for a new model A1? It's on a 3-year PCP ending December 2019. Although, apparently, it's already in positive equity, it will probably be better to leave this till later next year. A SEAT Ibiza or VW Polo look cheaper, but because Audis hold their value better there are good PCP deals - well, there were when we got ours in December 2016. Fiesta? Not sure I trust the reliability of the 1.0 engine, and it's unlikely to be as economical as the VAG TFSI. I think we'd go for the A1 1.5 TFSI as she still does some long runs. (2) Trade-in 2 cars: the A1 and my 'fun car' - a 2010 BMW 125i convertible, 3-litre, 57,500 miles, MoT to end June - for a new A3 1.5 TFSI cabriolet. As there's a facelift coming next year for the A3, there could be a case for going for that earlier next year while dealers are still willing to contribute £3,750 on the current A3. My wife, who would be the main driver (my Audi Q2 is excellent), is happy with either option. If you have any thoughts on which might be a better deal, I'd be very grateful. Am I correct in reading from this that you currently have 3 cars: an A1, a Q2 and a 125i cabrio? Seems to me there is a duplication between the A1 and Q2 and there would also be a duplication between the 125i cabrio and the A3 cabrio. So option (2) makes the most sense to me. You mainly drive the A3 cabrio; and your wife mainly drives the Q2. Or you simply swap between them as and when needs make most sense. I don't know how long a new A3 cabrio will be. Probably not until 2020, when the prices of all cars apart from electric ones are likely to rise by 10% to fund EC manufacturer fines for exceeding their corporate average CO2. The fine is €95 for every gram over the set corporate average. So if Audi's is set at 99g/km, but Audi's corporate average works out at 114g/km, that's a fine of €1,425 for every car Audi sells in Europe. So better to make the replacement in 2019 than wait until 2020. I have a 2009 Mercedes B160 SE CVT, which has a flat floor for front driver/passenger with no sill to get over. We are over 80 and easy entry and egress, particularly for urban OAPs, is vital. Mercedes no longer sells this feature. Do you know of any car of smaller size which has this aid to the less mobile? I’m really struggling with VW. I have a less than 2-year old T6 Transporter they won’t let me reject despite a constant string of breakdowns: 1 replacement engine, amongst many other things. Real horror story. Last time I got it back it managed 7.5 miles before returning to the dealer on recovery truck. I’m running out of patience faith and time with them not willing to accept it’s not fit for purpose. Can you help? I am a caravan owner (twin-axle model) and I currently tow successfully with a Volvo XC60 D5. I have always yearned for a ‘proper’ Range Rover (not badged Discovery, etc.) and I am now in a position to consider a purchase. My preference is for a second-generation model (1994 – 2002 P38A? ), but this seems to be a mixture of BMW/Jaguar ownership. I would be looking for a 2.5 Litre model (Diesel/Automatic) and I recognise that the reliability levels are low, particularly, I understand, the electrics. Could you expand, please. Moreover, recent information from an existing owner suggests that the battery runs flat if the car is not used after 4 days. As it would not be my daily driver, this would be a serious issue and any advice on the best model to consider would also be appreciated. How would you overcome the problem leaving it in, say an airport car park, whilst on holiday? I cannot believe that all models are plagued by this short battery charge life. Can you advise? The P38 Range Rover is covered here: https://classics.honestjohn.co.uk/reviews/land-rover/range-rover-p38/ These had straight six BMW engines, as also used in Vauxhall Omegas, and, unless re-mapped, were very slow on the road. Great off road, but slow on the road. Possibly not as good a tow car as you thought. A contemporary Toyota Land Cruiser Amazon was far better, with far more torque, but it's very hard to find one now that hasn't at some time done half a million miles towing a big shiny caravan or a hamburger stand. The used 2007 Volvo S80 I bought had some grinding noise in the engine. I took it to a Volvo dealership for diagnosis. They first diagnosed the alternator and asked for consent to fix, which I gave. It was later discovered not to be the alternator and ,after further testing, they said it’s the gearbox. I was charged £2,000 for repairs and I asked to get it back, because I can’t afford to pay that. They then charged me £500 for diagnostics alone. Is this common, and what do you suggest? REF DW & his 3008 Puretech 130 - Depending on the age of the car it might be due a software update for the engine ecu. There's has been a software update campaign for the older Puretech 130's that Peugeot / Citroen main dealers will carry out when you take the car in for a service / other work. Either ask your main dealer / UK customer service OR check your vin on Service Box as it will tell you if your car requires a main dealer visit. As a 308 Puretech 130 owner myself, I agree with HJ that it certainly doesn't lack torque. Tall story: Sorry? You are thinking of buying electric for economy but will have to pay £20,000 to do so. You already have a car that has a potential 6 years left in it. Where is the saving? I am so glad that HJ has advised someone to keep their existing car. Too often people change their cars at ridiculously low mileages and ages for no reason other than 'its time for a change' or 'the PCP is expiring'. These are car you know well, have presumably been reliable, so paying out another £10,000 - £20,000 for some shiny paint or an extra 5mpg is throwing good money away. Not everyone want to play bangernomics, but a modern five year old car should be every bit as capable as the brand new car it once was. All the cars I have owned have been. We have 2012/62 Nissan Note 1.5dci bought new (93k miles) It has been regularly maintained and any problems sorted straight away with a local independant garage. Thank fully those problems have been few and far between (timing belt at 70k mls, a/c radiator,). Main issue has been tyres (Original Contis lasted 27k miles, then Dunlops at 20k mls and present Michelins after ca 47k mls. These will be replaced soon with - yes - Michelins. Thanks, Lee. I updated the carbycar entries with that.